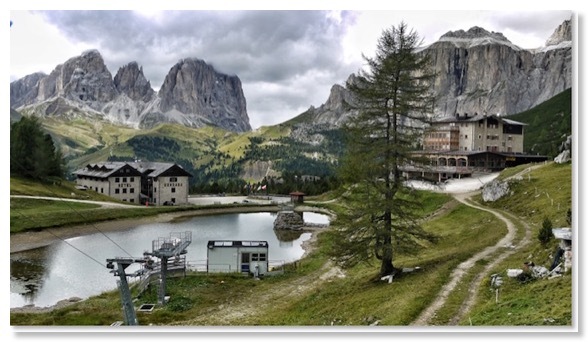 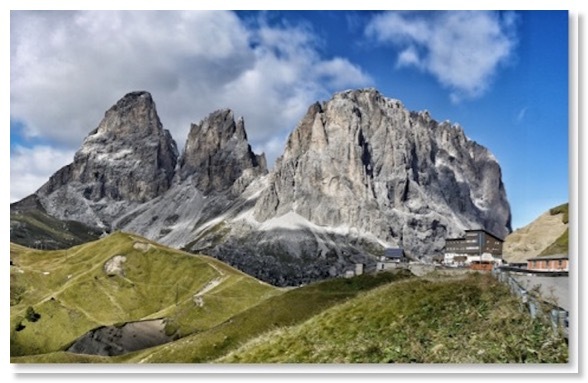 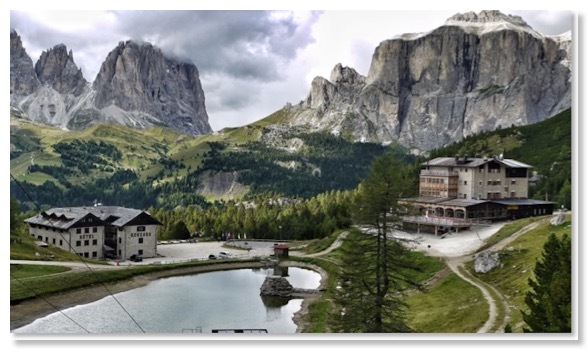 The Hotel Pordoi is at just over 2,100 metres, on the Great Dolomite Road as it winds over the Passo Pordoi. 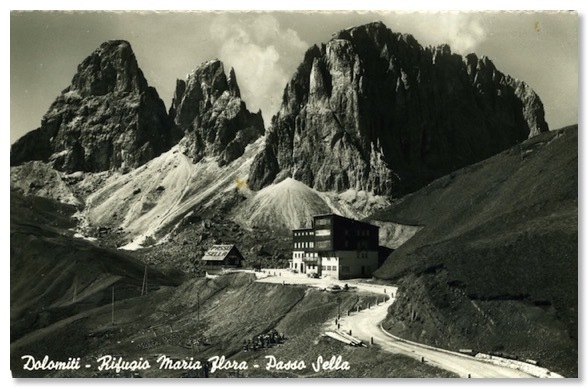 This photograph is taken from high above the Hotel, looking north west from the Col di Rosc to the prominent saddle of the summit of the Passo Sella. 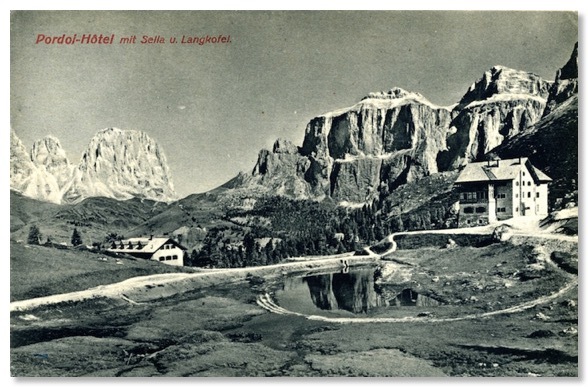 The three headed mountain to the left is the Sassolungo, or Langkofel. 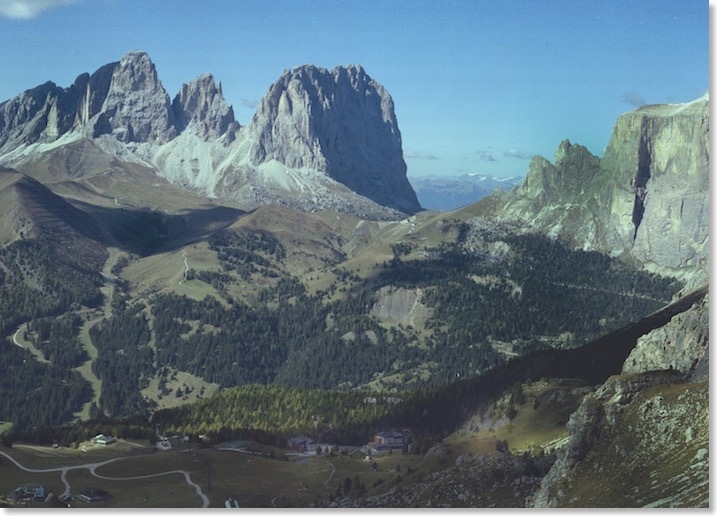 The cliffs to the right of shot are the Sella Towers and Piz Ciavazes. 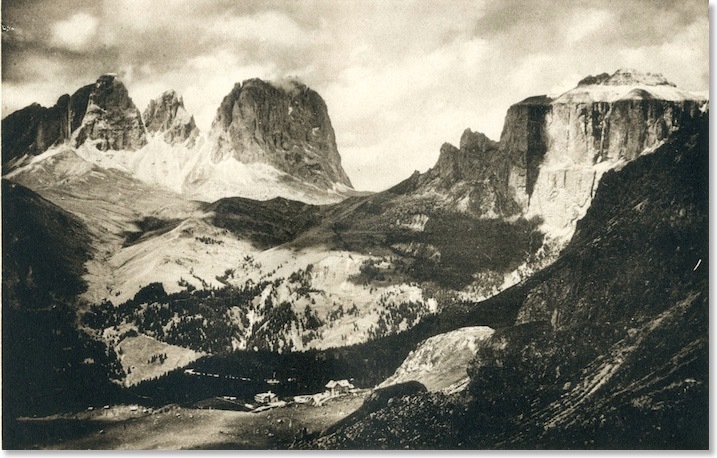 It is a view of mountains, unsurprisingly scarcely changed in 100 years. 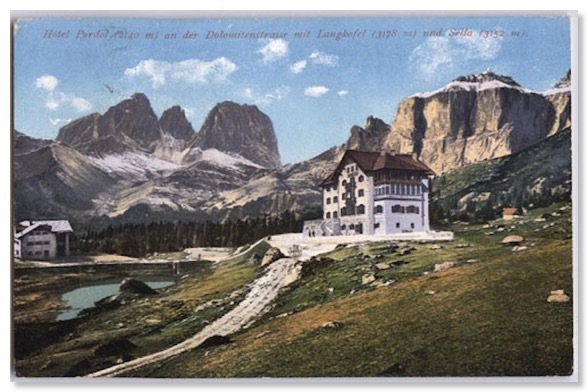 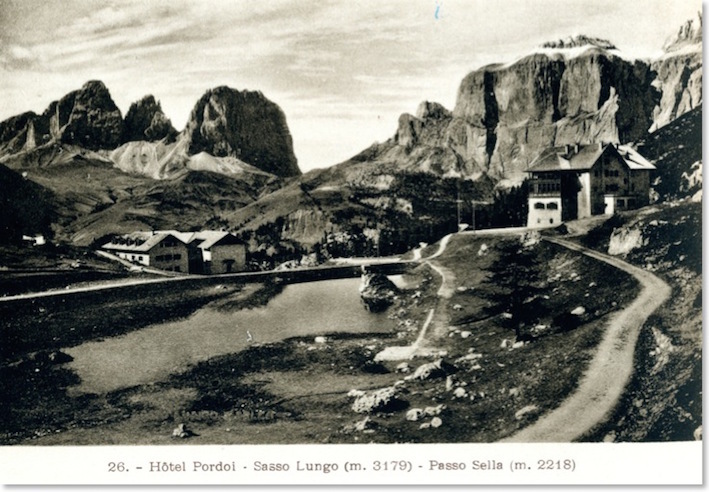 A web search unearthed this view of the Hotel Pordoi, said to be in 1903. 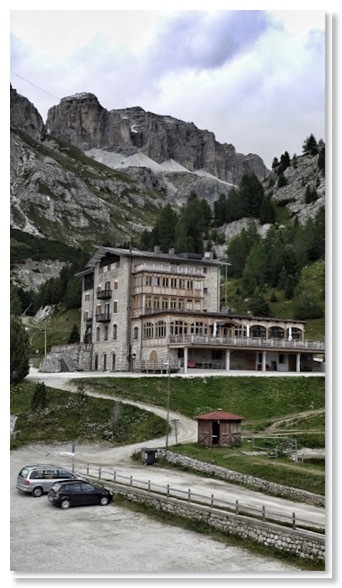 The Hotel’s web site says the building dates from 1890 and it was, I think, the highest point approachable by wheeled vehicle until the Great Dolomite Road completed the crossing of the Pordoi Pass. 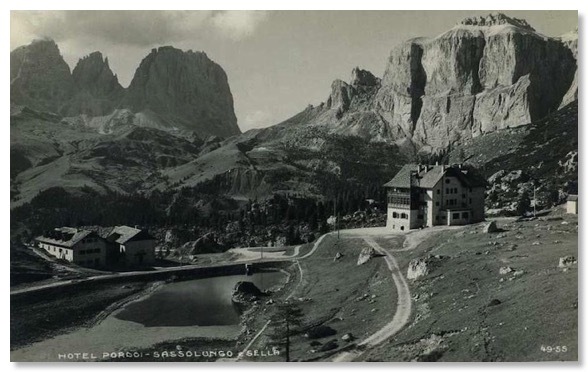 It, and the nearby buildings, clearly altered over time, however. 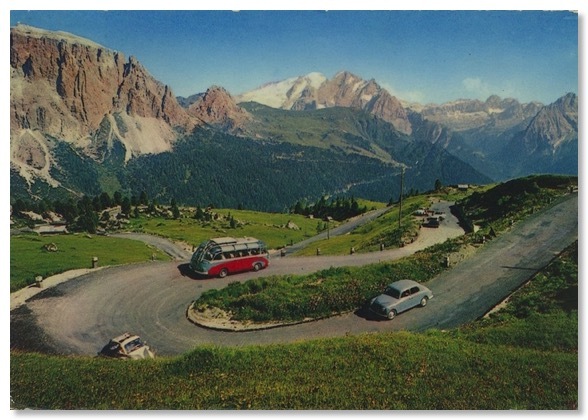 I also rather like this postcard, dated by the sender in August 1951. 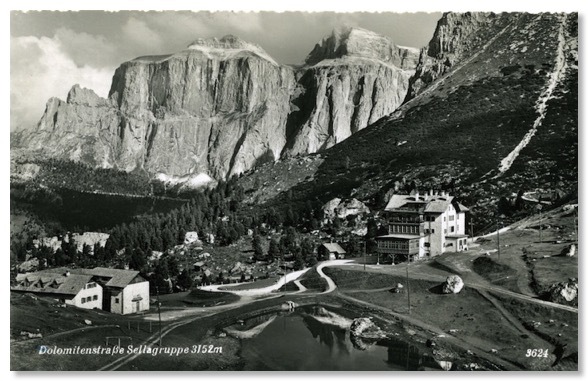 It shows the views in exactly the opposite direction to those above, looking across the Road, in more or less a south-easterly direction. 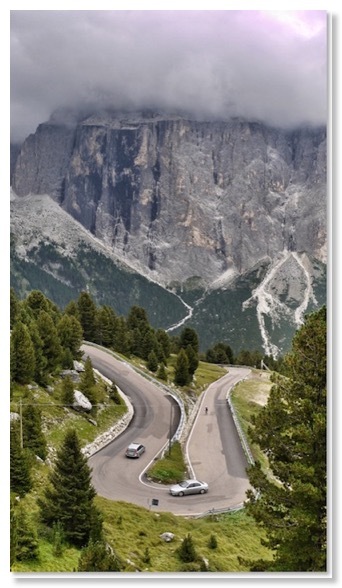 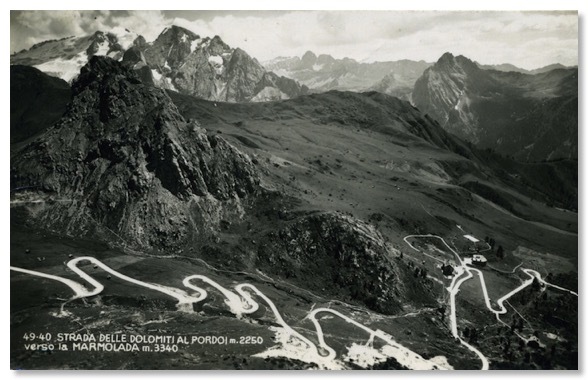 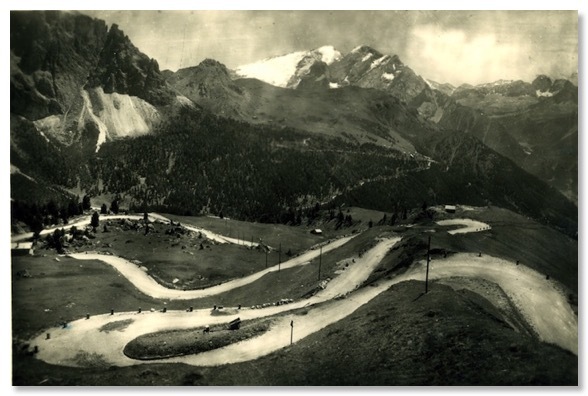 The postcard shows the tortuous twists of the Road as it climbs the Pordoi pass in this area very well. 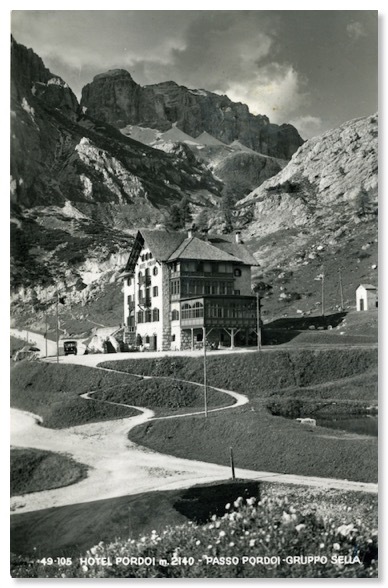 The Hotel Pordoi is the obvious building towards the right of the photograph. 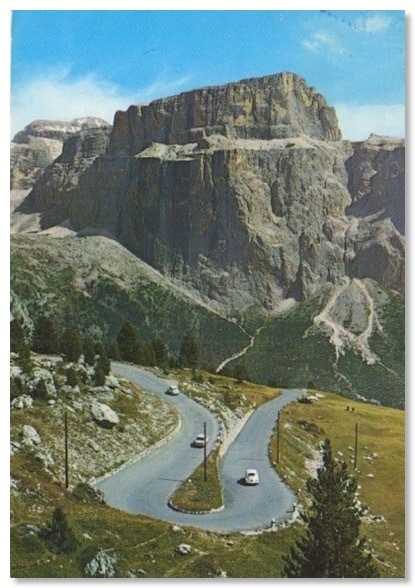 The card above is by Ghedina of Cortina, as is this quite similar one I came by subsequently, dated by its sender in August 1952. 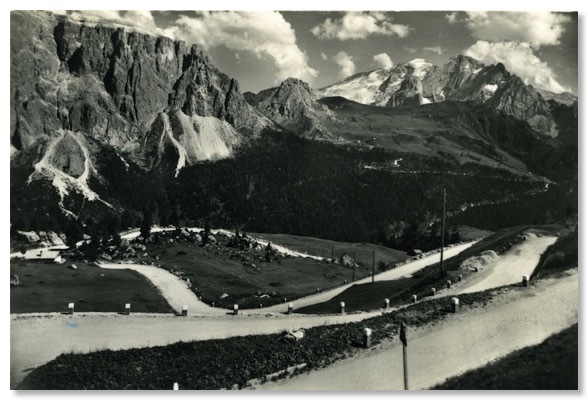 Around the same time (one is postmarked 1953, the other 1961), a different company was still selling these shots, same viewpoint, slightly wider angle, of the road before it was paved. 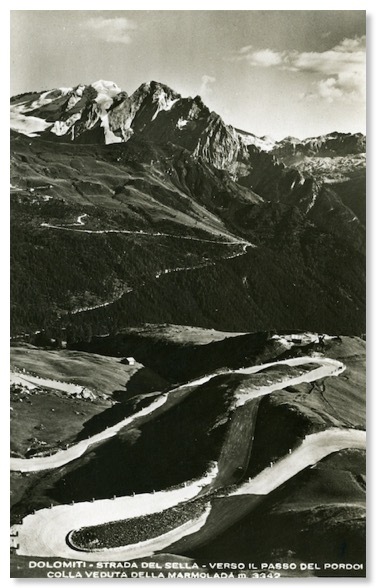 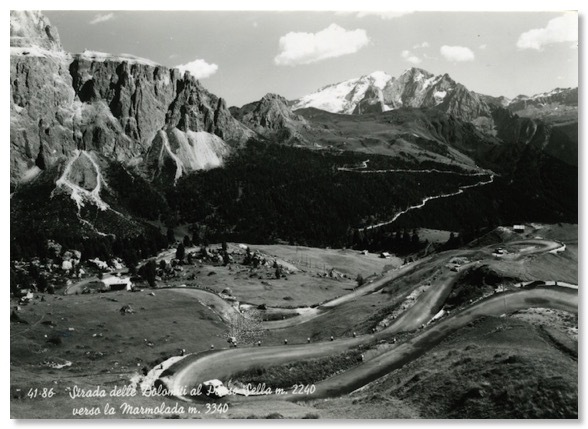 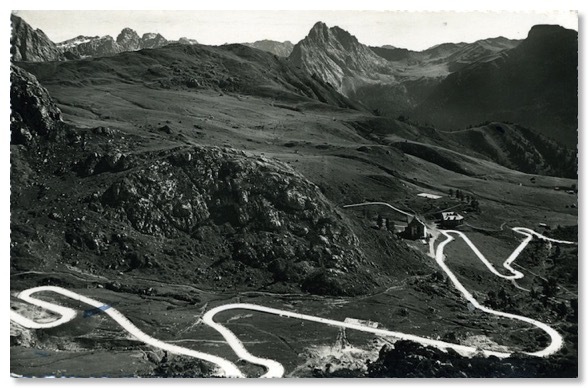 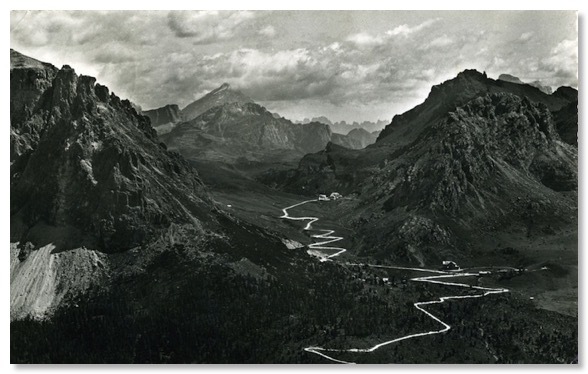 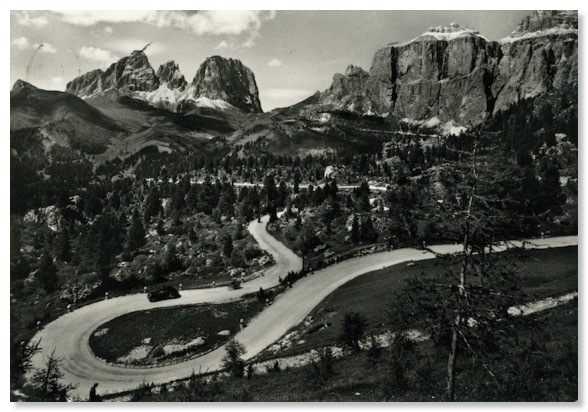 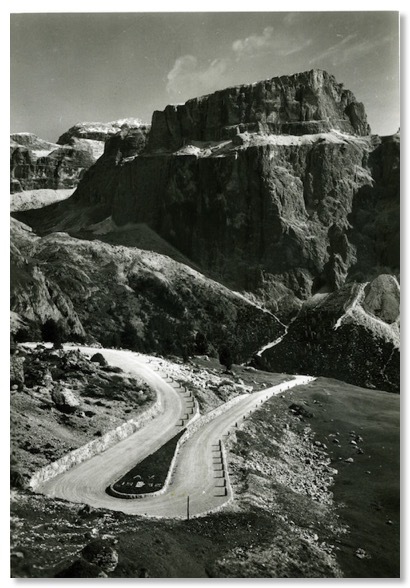 The postcard below, which was printed in 1950, shows the head of the Sella Pass (that’s the big notch in the skyline in the centre of the Zardini photo that began this page) and gives a great impression of how narrow these roads were at that time, even in very popular places.